Ishibu Onsen(石部温泉) is located west side of Izu Peninsula, Shizuoka. 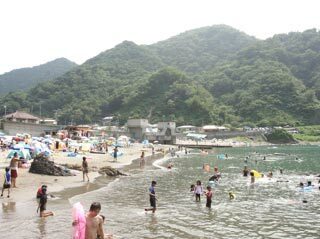 West side of Izu Peninsula has many beaches with Onsen and fresh fish. Ishibu Onsen is one of the Beach spots. There are about 30 small Hotels, and you can enjoy a beach, Onsen and fresh fish at the same time. There is free public Onsen which you can take with the swimming wear. There are parking, changing room, and public bath. During the summer, there is food stand opens at the beach. Public Onsen is open 24 hours. It is called Heiroku Jijo Onsen. Legend said, Heiroku’s kid was drown by big wave. After that, he was keep watching sea for his kid. After his death, people put Jizo statue to keep the sea safety and kids. Total capacity of the Onsen is about 15 people and good for a muscular pain, a neurotic pain and joint pain.